Many women turn to the e.p.t. Pregnancy test to find out if they are pregnant because this brand is so widely available in drugstores and supermarkets. Getting accurate results is crucial for many of these women. However, like any home pregnancy test, its results are not always accurate and both false-positive results and false-negative results do occur. Although rare, some women may get a false-positive result when using an e.p.t. Pregnancy test. Ovarian cysts, rare medical conditions and medications that contain the pregnancy hormone human chorionic gonadotropin, or hCG, may trigger a false-positive result, warns Drugs.com. Women who have recently given birth or had a miscarriage may have remaining hCG left in their system, which also may render a false-positive result. Taking an e.p.t. Pregnancy test too soon often causes false-negative results. Although the boxes of e.p.t. 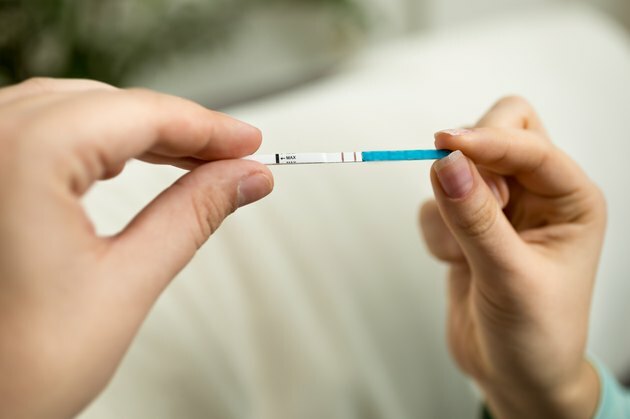 Pregnancy tests tout the test's capability to detect pregnancy up to five days before a missed period, the e.p.t.. website states that tests taken before the first day of an expected period can result in a false negative for almost one-third of pregnant women. Women can do a number of things to increase the accuracy of an e.p.t. Pregnancy test. Although it's best to wait until after a missed period to test, those that test before their period should use first-morning urine. The first urine of the morning is typically less diluted than urine produced later in the day, which makes the test more likely to detect the pregnancy hormone hCG. Women should also follow the e.p.t. directions perfectly and check the expiration date before using the test. Although e.p.t. Pregnancy tests claim to be over 99 percent accurate, the medical advisory board at BabyCenter.com explains that this statement is a bit misleading. Any home pregnancy test can claim accuracy of 99 percent or above if the manufacturer of the test is able to demonstrate that the test performs as well as an existing pregnancy test more than 99 percent of the time. Since home pregnancy tests today are more sensitive than previous tests, most home pregnancy tests are able to do this. However, this does not necessarily mean that the pregnancy test is this accurate at detecting pregnancy before or at the time of a missed period, explains the medical advisory board of BabyCenter.com. Women who receive a negative result on an e.p.t. Pregnancy test should always test again in a week or two if they do not start their period or experience other pregnancy symptoms. Those who want to know the results sooner than this should talk to a doctor about a blood pregnancy test instead. Women who receive a positive result should confirm the results with a doctor and seek prenatal care as soon as possible.